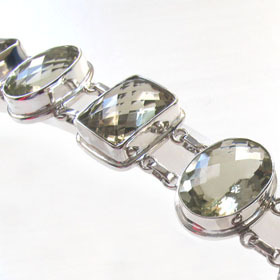 Green Amethyst Bracelets set in Sterling Silver. Green amethyst has a delicate sage green colour and suits the bright whiteness of sterling silver. See our green amethyst earrings and green amethyst pendants for coordinates.